Lindab Rainline is the roof drainage system that offers the highest quality and is designed to last. The worlds best gutter system has been developed to combine ingenuity and durability creating products that are easily installed and provides decades of service. The useful life of a component is of vital importance; the longer the lifetime, the fewer components needed to be produced. Therefore making the cradle-to-grave impact of Rainline even less. To further Rainline’s lifespan, products are coated with four protective layers. 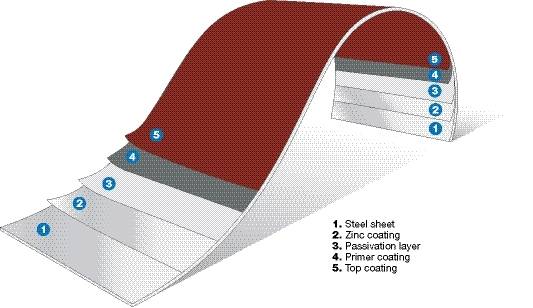 These coatings are applied to both sides of the steel to shield components from damage. The raw materials used to manufacture Lindab’s Rainline are rigorously tested along the North Sea of Sweden and the Atlantic coast of France for corrosion, in Florida and Australia for ultraviolet rays, and in China for resistance against environmental pollutants.